It’s barely 2am at Luanda’s Josina Machel Hospital, the largest in Angola, but already vehicles are queuing in a long line at the entrance. Most carry coffins. Others bear the unboxed bodies. Over the next five hours they will remove the mortal remains of 235 luckless Angolans for burial. It will be at a rate of a coffin for each 1.20 minutes. This macabre harvest is routine. 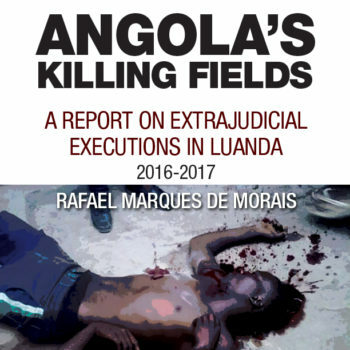 The Angolan government can massage the statistics but it only takes one observer to stand and count, as, one by one, grim-faced morticians and weeping relatives carry away the dead. Angola is in the grip of a yellow fever epidemic that the authorities would prefer to downplay. Malaria too is reaping a rich harvest. This year, these two treatable conditions are the main causes of death in Luanda, an overcrowded metropolis of more than six million souls. The tiny few who make it to the Josina Machel Hospital give a glimpse of the true situation: “Not worth it, sir. Too many people dying. I’ve never seen the like,” says one of the people charged with guarding the removal of the bodies at the morgue. Shaking his head, he takes up position to wait for the next, and the next. In a small two-door coupe sit three women wearing the false cheer of colourful cotton wraps, each embracing a tiny shrouded body. Waiting to depart. The clock ticks on: 3.30am and now traffic to and from the morgue entrance is chaotic as the comings and goings multiply in the pre-dawn hours. Not a minute’s rest in the morgue reception area. There should be an orderly line, in order of arrival, but there are space problems given the demand for the release of bodies. On the side, someone has established a ‘parallel business’: a space up front for a handful of kwanzas. There is no computer, no typewriter. Release forms are scrawled hurriedly by hand. I make my way to the refrigerated units in the body holding area. It has to be seen to be believed. I can’t ask for names, causes of death. I can only watch, listen, be present, and bear witness to the terrible truth. In the open space at the back of the morgue are the family members of the recently departed. Each carries their own 20-litre yellow jerrycan of water, a plastic tub and soap: the necessities for washing the dead. I count more than 20 bodies laid out in the open air as they are washed, dressed and tidied up by their loved ones in preparation for that final goodbye. The bathwater has nowhere to drain away. It pools on the floor, along with blood, discarded medical gloves, surgical masks, the clothes they were wearing when they died. There is a single drain. It’s blocked, putrid. “What a country this is. What a country this is,” laments one of the relatives. I stagger through this improvised washroom, trying to avoid the puddles, trying to contain my nausea. Many people are only wearing flip-flops. Some of the women are barefoot, though they may wear gloves and masks. I note the brand-new white bed sheets being taken out of their plastic covers ready to shroud the bodies in their final resting-place. A young man holds up a brand new suit and sparkling white shirt on coat hangers, soon to be worn by the person lying on the floor at his feet, waiting for a final wash and brush-up. To one side, others are removing the plastic lining of the coffin. Three anguished matrons call out to ask where they can wash the body. They look lost, unbelieving. Other voices answer kindly, suggesting a newly-emptied space. On they go with their grim task in the half-light. Making do, improvising. I pass signs indicating indoor compartments for the separate bathing areas of men, women, and children. There is almost no lighting and the conditions are as bad as the open-air area, save for the added privacy. All are fully occupied. On each side of the corridor are a total of 174 numbered refrigerated units. Gloves, masks, and bits and pieces of clothing litter the floor which is wet, dirty and bloody. A small group of people forms a circle around one of the refrigerated drawers. Inside are an astonishing four bodies, sprawled one atop the other, alternating head to toe. All that separates them is their clothing. That is what identifies them. They are not in body bags. They don’t have name tags around their wrists or ankles. No fewer than 474 bodies are arranged that way. The clock ticks on… 4.30am and there is gridlock in the 800 metre area between the Zamba 2 bridge and the entry to the morgue on Rua Samba (Samba Street). Vehicles carrying coffins come and go every minute, causing further chaos. Relatives and friends proceed on foot, carrying coffins from one side of Rua Samba to the other, in Bairro Azul neighbourhood, leaving their vehicles parked to avoid the traffic jam. Yet more are parked lower down. I see one father, tall and thin, carrying a tiny coffin wrapped in plastic under his arm. It’s for a newborn. His eyes are open, but he walks sightlessly, in this world but not of it. Across the street from the dilapidated morgue is the new parliament, which cost $311 million to build. From the morgue entrance you can see the pink dome of the new National Assembly, a US $311.2 million (from the President’s Office off-budget expenditures) replica of the US Capitol inaugurated last November, though the works are not yet finished. Members of Parliament have been informed that it costs US $1.7 million a month to maintain this building. Just 500 metres up the hill is ‘Cidade Alta’, the upper neighbourhood where the Presidential Palace is located. The Ministry of Health is on the same block as the morgue. The main pediatric hospital in the country, Hospital Pediátrico de Luanda, is just next door, and it contributes daily with more than 20 bodies to the morgue. One kilometre to the North is the ‘Marginal’, the iconic city’s Waterfront, which is the very symbol of the modernizing zeal of José Eduardo dos Santos’s MPLA regime. The Bay of Luanda now looks beautiful, if you can stand the stench of the putrid liquid from the sewers and storm drains that empties into the blue waters. The landscaping project cost over US $360 million. The waving palms aren’t homegrown. They were imported from Florida at vast expense. The gardens are well-tended, never short of water. Compare and contrast with the morgue, where each person has to fill a jerrycan to wash their dead. Meanwhile the informal economy – call it ‘black-market’, call it ‘small business’ – fills the gap. Street sellers throng the urine-smelling parking lot and the lane alongside the morgue. Three young people armed with thermos flasks, plastic cups, and individual sachets of instant coffee and sugar, are selling hot coffee. A group of women are selling disposable surgical masks and medical examination gloves for those about to brave the morgue to identify, wash and retrieve all that remains of their loved ones. It’s 100 kwanzas apiece for the gloves and the mask. One woman tells me that they were only 20 kwanzas each a few months ago. The epidemic is also breeding inflation. She knows the business of the morgue and says she’ll go as she is. I offer her gloves, explaining the threat of disease. Her cheap, flimsy rubber sandals offer no protection to her feet. A short while later, Tchizé dos Santos, one of the President’s daughters and an MPLA Member of Parliament, makes an appearance on on the state-run TV channel TPA (Angolan Public Television) as the godmother of a “Tea Club” gifting gloves, surgical masks, syringes and other one-offs to the hospitals. There’s a shortage in the hospitals but the leadership can get hold of these medical materials for public relations stunts to benefit their personal image at a time of crisis. Informal marketeers can also get hold of them, and sell them, for a price. Another of the nice little earners in the side streets are the small sachets of South African ‘whisky’. Each costs 100 kwanzas. They are sold as a hand disinfectant. After dealing with twenty or so corpses, one of the morgue workers calls for one, saying his hands feel itchy inside the household rubber gloves he uses in preference to the latex ones that he says tear far too easily. The morgue doesn’t supply these basics to its workers. The street vendor reminds him that he already owes 300 kwanzas on the slate. This worker has just deposited a body in notorious ‘Chamber Five’ – a cold chamber you might know better as a cargo container or ‘sea can’. So many bodies transit in and out overnight that it’s left open until 7am, when a modicum of calm returns. In ‘Chamber Five’ there are 450 bodies piled up on shelves and across the floor. This is a deposit for the unidentified, for those mangled in accidents, for the faceless victims brought in by the Criminal Investigation Service and Police. The nauseating odour of decomposing bodies is unbearable and yet there is a continual hustle and bustle of frantic relatives and friends going in and out, desperately searching for loved ones. Reeling away from ‘Chamber Five’ I return past the makeshift open-air washroom, unable to comprehend the sheer extent of institutionalized inhumanity that can allow this: a metaphor for the destiny of Angola’s masses. At the entrance to the refrigerated units, I see a large woman dressed in a t-shirt and wraps, sitting and holding to her breast a girl, not yet two years old, wearing only a diaper. She sings a hymn to the little girl, while her body is washed by two other women singing in harmony. Each tenderly caresses a small hand, then a foot. They radiate love and peace, restoring some humanity to the scene and leading me to feel a renewed hope. Then they peel off the small adhesive bandage stuck to the child’s forehead, which bore her name. She tells me how the other two women got a call from the hospital to say their relative had died during the night and the body was in the morgue. Overnight family members had identified the body only by the black trousers he was wearing. They had removed him from the morgue, washed him, placed him in a coffin and taken him home for burial. Days later, the dearly departed had walked into the house, having been discharged from hospital, shocked to the core to find that his family had already held his funeral. “He’s still mentally affected by this”, the lady says. The other lady also has a story about an identity switch in the handover of bodies which caused yet another grieving family to bury the wrong body. “The BaKongo (an ethnic group native to Angola’s northern border, and the neighbouring region of DRC), as soon as they realized that their sister had been buried by mistake, managed to track down the family and went to them to demand the exhumation of the corpse.” The conversation veers off into a discussion of how some ethnic groups are better than others at defending their rights while others allow themselves to be abused. A man leaning on a car alongside (who has been employing the sachet of South African ‘whisky’ to moisten his surgical mask in an attempt to neutralize the fetid stench in that place) interjects indignantly about this discriminatory tone of the conversation. He recounts how he spent seven years so afflicted by a foot infection that he couldn’t even put a shoe on his foot. He didn’t have enough money to be taken for treatment in South Africa, Namibia or Europe, but eventually he saved enough to cross the border into the Democratic Republic of the Congo (DRC), where he was cured. The conversation is interrupted by the arrival of a hearse from the funeral agency for which these three ladies were waiting. In the meantime they had finished washing the child, dressed her completely in white and shrouded her in a cloth. They address the man, begging his pardon. Tears falling freely now, they proceed to fetch the small white coffin from the hearse, place the child inside, and carry her to the vehicle. It is 7.13am. In these five hours 235 corpses have been taken away and the pace now slows. The cleaning crew begin their day, battling to try to restore something approaching hygiene to this nightmarish scene. It is Saturday. The reception area of the morgue, during a calm moment on a hectic day. On Monday I turn up at the office of the Health Minister, Luís Sambo, a ten-minute walk from the morgue. There is an impressive array of modern, electronically-activated turnstiles in the passageways, but they appear to be out of order. I explain to the Secretary the reason behind my request for an interview with the Minister. I sum up what I have seen at the morgue. The secretary tells me the Minister is away, but just as she is directing me to his legal counsel, Adalberto Miguel, the Minister himself walks in and greets me, with a polite “Good Afternoon”, as he goes into his office. All the same I am required to speak to the legal counsel, who takes note of my account of what I have witnessed at the morgue, which is practically next door. His counsel thanks me and tells me the Minister “is affable, easy to get along with”. Luis Sambo spent ten years as regional director for Africa of the World Health Organization before being appointed Secretary of State for Health (deputy minister) nine months before his recent promotion to Minister on March 5. Apparently, he’s not sufficiently well-informed, so he won’t be giving interviews or granting audiences for two weeks. In effect, the Health Minister’s response to the alarm being sounded is: ‘No Comment’. Three days on, it’s still hard to take in. Questions accumulate: How can this be? Who stands by and lets this happen? Why do we, the long-suffering Angolan people, put up with it? When will it end? What can be done? The trouble is we all know the answers but fear and apathy have held us back thus far. Nightmares belong to the night and the clock is ticking.